Google Analytics is the the most popular and widely used freemium web analytics service on the internet. From website traffic analytics to e-commerce reporting, it offers tons of data to the user to gain insights from his website. What Makes Google Analytics So Likeable? Goal tracking: You can set goals like leads, newsletter signups, etc. and see the conversion rate for them. Smart site search: You’ll have a list of every keyword people search for on your site. Know exactly what they think is missing and what they have trouble finding. E-commerce funnel visualisation: Get to know how many users reach the end stage, how many of them abandon in between, how many enter at different stages. Customized dashboards & reports: Any report can be added and arranged via drag and drop functionality. Set different parameters and generate reports accordingly. Google Analytics is built upon a powerful data reporting infrastructure. The Google Analytics Reporting API allows you to request dozens of reports that are valuable to users to make future business decisions. Some of the reports include- mobile performance, traffic acquisition, keyword analysis, e-commerce behaviour, etc. You can also compare reports in two date ranges. Google analytics generates lot of data. This data is complex and heavy to understand. It’s not accurate all the time. So many other solutions integrate Google Analytics with them to filter unwanted data and generate more accurate and enhanced reports. 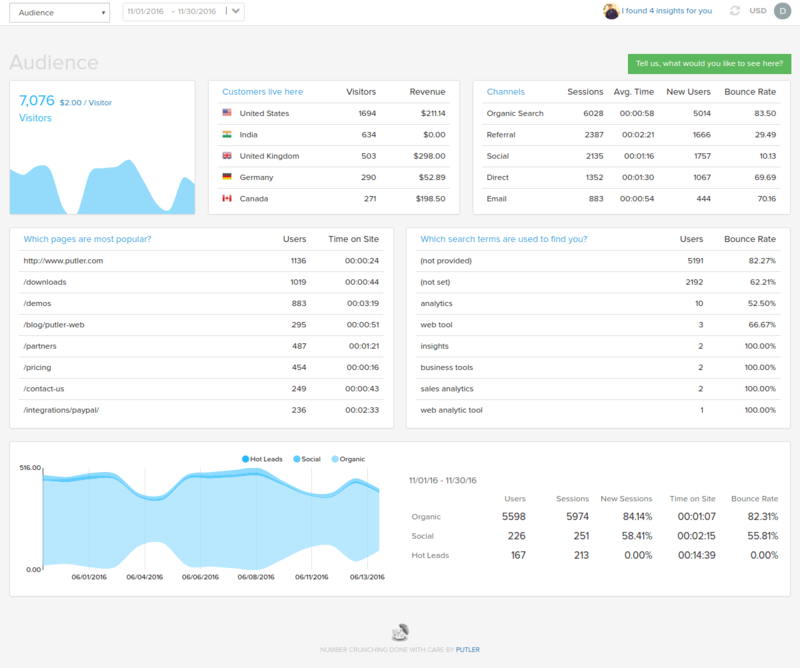 Is Putler The Best E-commerce Reporting and Analytics Tool For Google Analytics? Putler is one such solution that integrates with your Google Analytics account and generates important reports. This includes visitor data along with ecommerce data in a single dashboard which is clean, simple to understand, accurate and precise. It’s an all-in-one solution with many unique features. Accurate Ecommerce data: Google Analytics either calculates extra transactions or less transactions that give you an error in your total sales and product count. Refund data: Google Analytics doesn’t track refunds which makes your sales data go haywire and if refunds are very high, it will have a great impact on future business decisions and forecasts. 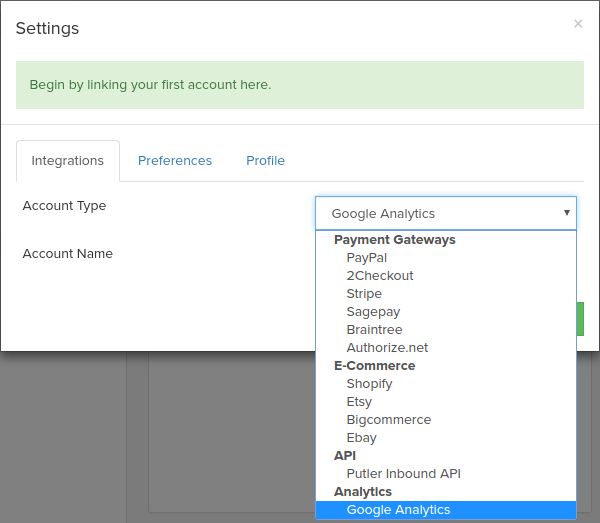 Instant & real-time e-commerce data: Google Analytics doesn’t track e-commerce transactions immediately. It takes time to display that result. Example- To view today’s transactions, you can view it only from the next day in Google Analytics but with Putler, you can see it on the spot. Personal customer’s details: You also can’t see complete customer details with Google Analytics except their location and time. With Putler, you get customer’s personal information- name, email, orders, transaction status,etc. This helps you identify your loyal customers. Subscriptions Dashboard: For subscription businesses, all the important metrics like MRR, churn rate, LTV, ARPU, etc. are very crucial which are not available in Google Analytics. But Putler provides a neat dashboard having all these metrics. Intuitive search: Putler’s search feature works at a blazing speed. Type a few characters and Putler instantly brings up all the related combinations for the searched term thus giving you the desired results you queried for. Consolidation: Accurately combine multiple Google Analytics accounts and view website analytics of any number of your websites. You can completely trust on Putler for giving you best and error-free results always. Click on Continue. It will ask you to enter your Google Analytics credentials. Enter it and you will see instant reports of your business.